Washing the set can be difficult. I think a dry cleaning will help you maintain it better. The material is heavy and durable but can't be washed often. The colors haven't faded after 2 washes. This fun and comfortable plaid duvet set is made with 100-percent cotton for comfort and convenience, as it's machine washable. 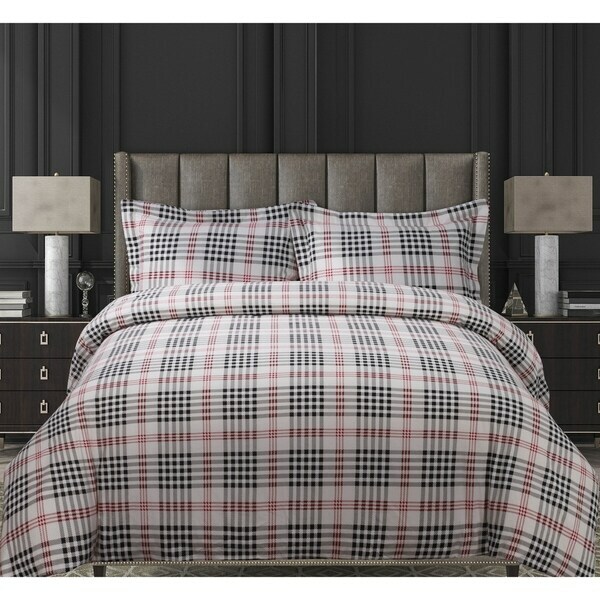 Available in queen or king sizes, this comforter set is ideal for any plaid lover. Nice flannel duvet. Washed up very nice and looks great on my son's bed. This is a favorite of mine especially on a cold night. I used this throughout December because the flannel was just perfect for a cold night and complimented My Christmas decorations. The king size was good because we are able to cover up two dogs and two people. This one just makes me smile. I wanted something warm for the winter season and this flannel duvet set worked well. I washed it before using it as was afraid it might start pilling but actually had no problems with it. Pretty much what I was looking for. Plaid Duvet is very soft, even after washing. No need to iron unless you desire a crisp look. These sheets are well made. The material is heavy duty flannel. I followed the instructions about pre washing them with vinegar and have not had any problems will pilling. I would definitely buy them again. FYI they are black and red (I thought they were navy and red). Really soft and warm for winter. We put it in our camper and love it. Washes well and doesn’t pull up. Satisfied with this duvet; I would buy it again. "I really like this pattern, but Flannel is way too hot during he summer. Is this pattern also available in regular cotton or other fabric?" Unfortunately, we currently only carry it in the flannel option shown. "Hi. Where is this product made?" Hello t l, this product is made in Pakistan. Thanks for shopping with us!